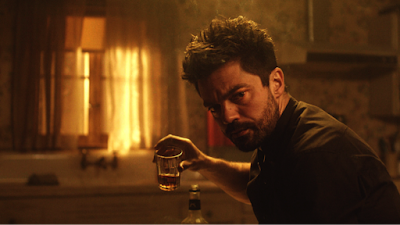 For someone unfamiliar with the comics, Preacher starts off rough with a lot of character introductions and shifting between locations, making the pilot episode difficult to follow. However, as episodes move forward, the show comes together. Stylistically, Preacher is like the baby of Quentin Tarantino and Robert Rodriguez with dark humor and gratuitous gore. While the show has a lot of characters to get straight from the beginning, it turns into a strength for the show, especially in providing the audience with a range of female character types, all of whom are strong in their own ways. so turn back now if those are against your morals. In episode one, a supernatural force (that we later learn is Genesis, an angel/demon “mistake”) enters the atmosphere of earth and moves from preacher to priest to Tom Cruise, causing each one to explode during their sermons. 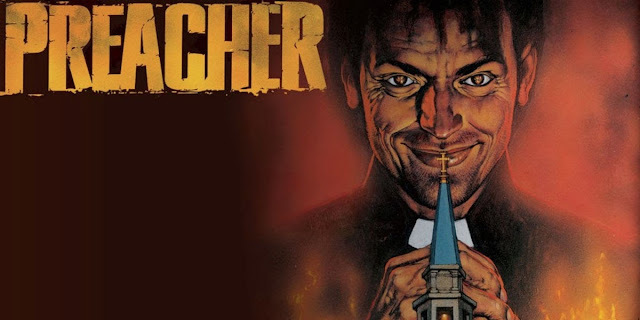 Genesis then inhabits Jesse Custer, a preacher in Texas with a dark past involving robbery and murder. He’s about to give up on his church, but he suddenly feels like sticking with it after the entity enters his body. Genesis gives him a special power with which he can use to get people to do exactly as he says, but he needs to be careful with his words, otherwise people will rip out their hearts in front of their mothers or other literal things. In this episode, we are also introduced to Cassidy, an Irish vampire addicted to hard living. He lands in Texas after a bloody brawl on a plane and quickly becomes Jesse Custer’s best friend. Tulip, a badass and Jesse’s ex-girlfriend, enters the show as well and invites Jesse on a questionable job that involves his dark past, but he has no interest because he feels called to the church. Tulip spends a lot of time with Jesse, trying to convince him to take the job, and she ultimately brings the job to him, which digs up a lot of feelings from the past. Other major characters in the show include Odin Quincannon, a power-hungry man who owns a slaughterhouse in Annville, Texas; Donnie, Quincannon’s right-hand man; Eugene Root, the sheriff’s son who left himself disfigured after a murder/suicide attempt; Emily Woodrow, a single-mom, waitress, and a big help to Jesse in the church; and Fiore and DeBlanc, two angels who are the caretakers of Genesis. Throughout the season, Fiore and DeBlanc are on the hunt to get Genesis back into their coffee can. They end up in a fight with Cassidy after attempting to cut Genesis out of Jesse with a chainsaw and Cassidy kills them. However, as angels, every time they die, they re-spawn. Jesse uses Genesis to try to bring the residents of Annville to God and to be better people, but it backfires a few times, including when he accidentally sends Eugene to hell and almost loses his church to Quincannon after a bet. Jesse sees that the people need God more than ever, and in the final episode, he tries to bring God to Annville by calling Him on a phone with angel hands that he and Cassidy dug up from one of Cassidy’s altercations with Fiore and DeBlanc. However, the other end of the call is answered not by God, but by an impostor, and it is discovered that God is missing. 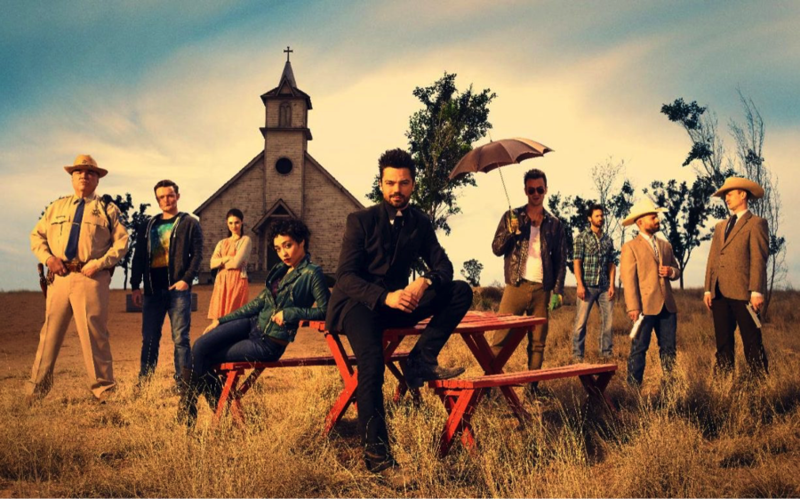 The first season of Preacher leaves us with Jesse on a mission to find God in a literal sense, while the townspeople feel lost and lose their calling to be moral people despite having had God in a figurative sense all along. Not only is Jesse on his mission at the end, but Fiore and DeBlanc also send a bounty hunter from Hell to kill Jesse. The bounty hunter is introduced earlier in the season through what appear as flashbacks to the 1800s, but it is later revealed through a repetitive montage that he is cursed to relive his life’s horrors in Hell. While the show is a little difficult to get into and understand at first, it gets intriguing and more fun as the series unfolds. It will be interesting to see how the characters develop into the second season and what kind of religious metaphors will be provided in the dark comedy. The show is more action/comedy with horror elements than a straight up horror show, but it is fun nonetheless and definitely worth a watch. AMC has ordered a 13-episode second season that will air in 2017. 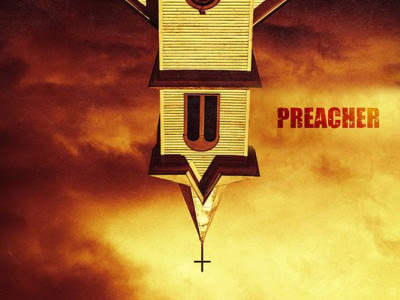 Are you a fan of Preacher?